There's something beautiful about the fact that any person can go into a library and borrow a book that could change their life. That even though classic literature can feel out of reach, it is only ever a library card away. But with the internet and ebooks, the free information that made a library unique is no longer exclusive. Classic literature can be found with a Google search and read on sites like Project Gutenberg. So what do brick and mortar libraries offer that Amazon can't? It's a discussion that's been going on for a while in the UK, where public libraries are increasingly being shut down, and one we continue to have here in Australia. I often visit my local library. I tend to go in the after-school hours, so there are children everywhere. In the children's section I can see mothers guiding young, chubby hands across picture book pages. I think of Mem Fox's advice about how children should hear a thousand stories before learning to read. Almost every computer is in use and there are signs up inviting me to use the library wifi. A man sets up a game in the newly installed XBox gaming area. At the desks to the back, people crouch over laptops plugged into the wall. People chat together and flick through magazines on the couches. There are flyers about learning basic computer skills, myGov and 3D printing, author talks and improving your resumé. Endless posters on the walls advertise children's programs and book clubs. It's tempting to dismiss libraries as relics, defunct in the face of the internet and worthy only of nostalgic reflection, but that's not reflective of what libraries are today. They have adapted with the times. In my library, there was once only a handful of computers, but now there are rows of them as well as a space for video games. And while a few years ago there were few comics and magazines, there are now large sections for both. To think of libraries as static is to misunderstand what they are. Libraries are not just repositories for media, but purpose built to suit the needs of the community. "Libraries will always be about accessing books and information, but they are flexible entities. Libraries are as much cultural hubs as they are quiet spaces to read." For parents stuck on places to go with their child on the holidays and weekends, public libraries host children-focused events. With the dwindling of independent bookstores, how many places are left where you can take your child for a free book reading, much less one accompanied by an AUSLAN interpreter? And though we take for granted that everyone can get to and use a computer, many rely on libraries to provide them with free internet access, as well as immediate face-to-face help in using technology. According to the 2014-2015 Australian Public Libraries Statistical Report, though book circulation is declining, use of public terminals (computers and iPads) in libraries is increasing. When you live in a suburb or town where the city can feel far away, libraries can provide the chance to engage in literary culture through book clubs and author talks. At a library, you can borrow a book, but you can also find others who want to talk about it. In a time where we are feeling increasingly socially isolated, the free classes and events that libraries provide are opportunities to engage with one another on a local level. Libraries also continue to be one of the few places you can sit down for extended periods of time for free. Students can study with resources easily available, or people can come to plan their next project and have a nice, but quiet, discussion. Opinion articles that make broad statements about how 'books are cheaper now' don't take into account how libraries are actually used. Libraries will always be about accessing books and information, but they are flexible entities. 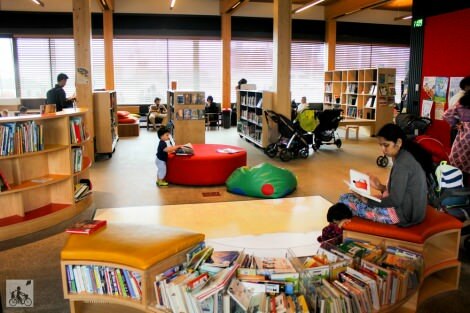 Libraries are as much cultural hubs as they are quiet spaces to read. What makes a library relevant today is how it continues to serve the people who enter its doors. "What makes a library relevant today is how it continues to serve the people who enter its doors." The local, State, and National Libraries that most people can get a borrower's card for also offer remote access to databases - you can use them at home. That can lead to an equality issue because some people's libraries offer a lot more than others - just as some school libraries offer a lot more to their pupils than others do. Also a lot of the best info is ever more expensive and not available to the public. Once you could go to a university library on the weekend and use the collection, but now so much of it's electronic, you can't without a password. We need to be careful that the need to prove 'relevance' (popularity) doesn't replace the depth and diversity of library collections. Libraries are part of the fabric of a town or city. They are as essential as schools, post offices and shops to citizens and particularly valuable to the very young and the very old. And all those in-between can also gain a sense of community and feel less alone. It's not just about books, although books are the centrepieces. Long live the local library! A library is one of those untidy philosophical tussles between giving what is owed to a labourer for his hire and making him give it away free, which may explain why many of the seriously serious books, which require their authors to spend a lot of their own resources to improve their brains to the stage where they can write the books, aren't to be found in the municipal library where most of the ordinary folk with an interest in knowledge gather. Social investment in the knowledge base of the population is good, but the other edge of the sword of the state using its power to turn private goods into public goods is that authors have to sacrifice some of their market. One can become a community borrower in a university library for an annual fee which is low but not particularly modest, and perhaps it's only the fee which stops university libraries from being overrun by general public borrowers to the stage where it affects the university student's ability easily to find books on the shelves. "the other edge of the sword of the state using its power to turn private goods into public goods is that authors have to sacrifice some of their market". Here's news: authors use / benefit from libraries too, as part of the process of creating their books. A couple more benefits of a library: 1. When Google fails to deliver, library staff are trained to search and can find things that you might have missed - plus they have additional resources available that are not available to the general public. 2. Your local library will buy books for you. Just ask. So far, since I retired and became an OAP three years ago, my local library has purchased all the books I've requested, none has been declined. Total = 14 so far. My 'local' - the Holland Park Library in quiet suburban Brisbane - is a real community hub with all the sorts of things you talk about happening. One of the most cheering things I have seen recently is one of the library ladies reading 'The Cat in the Hat' to a group of enchanted littlies. She read extremely well, neither 'elocuting' as in the ABC of yore nor speaking with the faux 'Strine' accent beloved of so many of our politicians. As a sort of Australian Henry Higgins I was enchanted. Way to go!